When they were first running around boatyards in Norway as youngsters in the 1970s, Trond Schou and Nils Johnsen weren’t thinking about their legacy. They were thinking about — and obsessed with — sports cars and boats. That still holds true today. Just on a much grander scale. 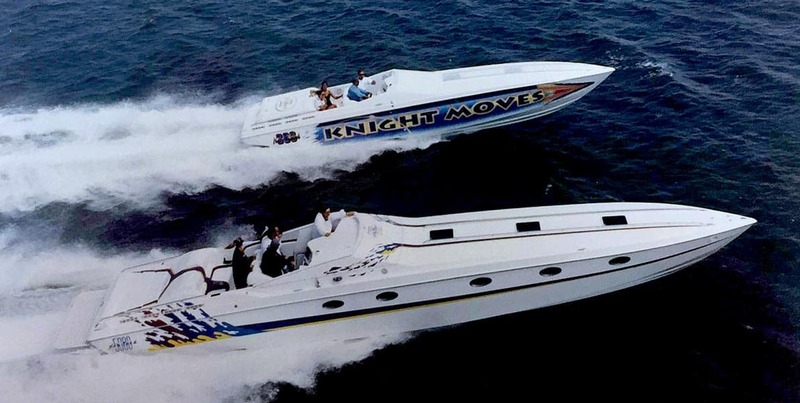 Twenty-eight years ago, the first Nor-Tech powerboat hit the Gulf of Mexico in Southwest Florida with exceptional craftsmanship, speed, and style like no other. Nor-Tech Hi-Performance Boats had 2 employees — Trond and Nils. If there’s a boat we can dream up, why not build it?” says Nils, Nor-Tech’s chief designer who is often inspired by his cherry red Lamborghini Countach. “If we can build it, we will. The co-founders can still be found on the production room floor working on boats and designs in one of their four Southwest Florida facilities just as much as they can be found in their offices, handling the day-to-day operations. A young Trond Schou and Nils Johnsen start hanging out in Norway. Trond and Nils move to the U.S. but don’t want to leave behind all of their creations. They have 16 of their 50 boats shipped to the U.S.
Trond and Nils start building 50-foot high-performance V-bottom boats in a 6,000 square foot facility in Cape Coral. Nor-Tech Hi-Performance Boats is a two-man company. Ted Dzus of Dzus Fastener Co. purchases the first Nor-Tech boat — a Nor-Tech 5000 Supervee. The first model line expansion kicks off with the introduction of the 3800 Supervee. Nor-Tech has become known in the industry for high-quality, custom boats. They decide to offer more than V-bottoms, and the 5000 Supercat takes the industry by storm. With 55 employees and boat-production booming, Nor-Tech expands to a 45,000-square foot facility in North Fort Myers. Nor-Tech takes advantage of the increased production capacity at the new facility and starts production of the 3600 Supercat. The 3600 becomes Nor-Tech’s best-selling catamaran and establishes the company’s legacy as a performance boat builder. The U.S. government commissions Nor-Tech to build a drug-chase boat. The Nor-Tech 43 is still in use today and has helped intercept millions of dollars in drugs in the U.S., Bahamas, and Panama. A Nor-Tech catamaran took the title of the Fastest Boat in Norway. It ran a two-way average of 191 mph and a top speed of 202 mph. The economy was crashing, but Trond and Nils wanted Nor-Tech to survive and thrive. They got innovative and created the 390 Sport. The do-it-all, go-fast center console would become the best-selling boat in Nor-Tech history. Nor-Tech brings luxury boating to the fishing world with an amazing catch — the 392 Superfish. The styling of the 390 Sport gets an upgrade with Sport Hull 100. It ran a GPS speed of 101. Nor-Tech has 155 employees and adds a production facility in Cape Coral that is 55,000-square feet. To date, the total manufacturing space in four locations is more than 100,000 square feet. Nor-Tech is currently one of the fastest-growing boat-building companies in the U.S.